A computer is a multitasking electronic device that processes information. A computer is an electronic device that is designed to work with given ‘data’. It has the ability to store, retrieve, and process data. The term computer is derived from the Latin term ‘computare’, which means to calculate. A computer represents the decimal numbers through a string of binary digits. Charles Babbage is called the "Grand Father" of the computer. The first mechanical computer was designed by him and was known as ‘Analytical Engine’. It would use read-only, memory in the form of punch cards. Computers cannot do anything without a program. It is an advanced device that takes raw data as ‘input’ from the user and processes these data under the control of set of instructions called ‘program’ and gives the result as ‘output’ and saves output for the future use. It can process both arithmetic and logical calculations. The basic components of a modern digital computer are: Input Device, Output Device and Central Processor. Computers work through an interaction between hardware and software. Hardware refers to the parts of a computer that can be seen and touched, including the case and everything inside it. The most important piece of hardware is a tiny rectangular chip inside the computer called the central processing unit (CPU), or microprocessor. It's the "brain" of the computer. It is that part which translates instructions and performs calculations. 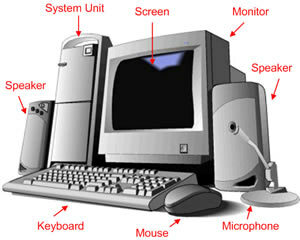 Hardware items such as the monitor, keyboard, mouse, printer, and other items are often called hardware devices. Software refers to the instructions, or programs, that tell the hardware what to do. A word processing program is used to write letters in the computer is a type of software. The operating system (OS) is software that manages the computer and the devices connected to it. Two well-known operating systems are Windows and Macintosh operating system. Nearly, every computer uses the Windows operating system. Computers range in their size and their capability. They can be classified such as small or tiny and big or super computers. Supercomputers are very large computers with thousands of linked microprocessors that can perform even the most extreme complex calculations. Then, there are tiny or small computers which are embedded in cars, TVs, stereo systems, calculators, and appliances. These computers are built to perform a limited number of tasks. The personal computer, or a PC, is designed to be used by one person at a time. This section describes the various kinds of personal computers: desktops, laptops, handheld computers, and Tablet PCs. Computers can help complete many tasks in a given time. In workplaces, many people use computers to keep records, analyze data, send emails, do research, and manage projects. At home, people use computers to find information, store pictures and music, track finances, play games, and communicate with others and these are just a few of the possibilities.